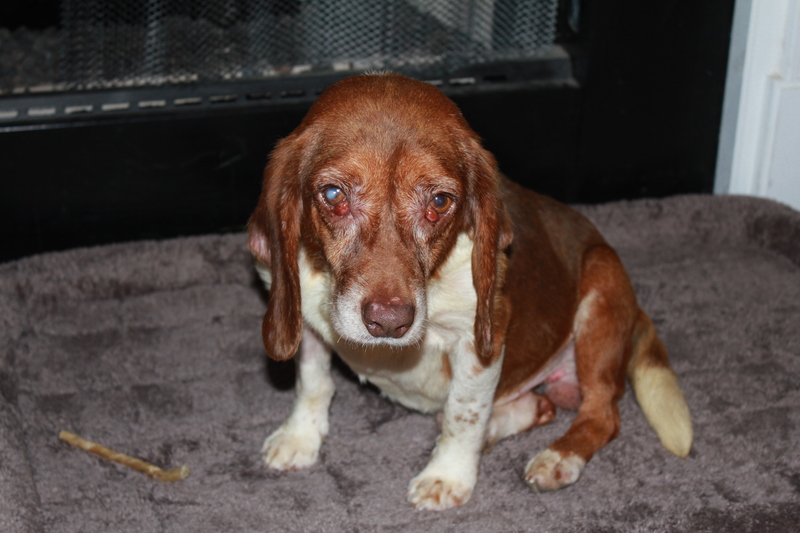 One of my sweet fosters, Chester P squared, or Gertie Powdersville had to have surgery on Friday. Gertie had an FHO today: a Femoral Head Ostectomy. This will hopefully alleviate the pain in her left hip, caused by some sort of unknown trauma. We suspect she was hit by a car at some point between losing her owner and arriving at the shelter from which Middle Mutts pulled her. She’s an old girl at 10-11 years, but she’s been doing great since surgery. Me: not so much. Here’s why. From the front, Gertie looks exactly like she did before surgery! 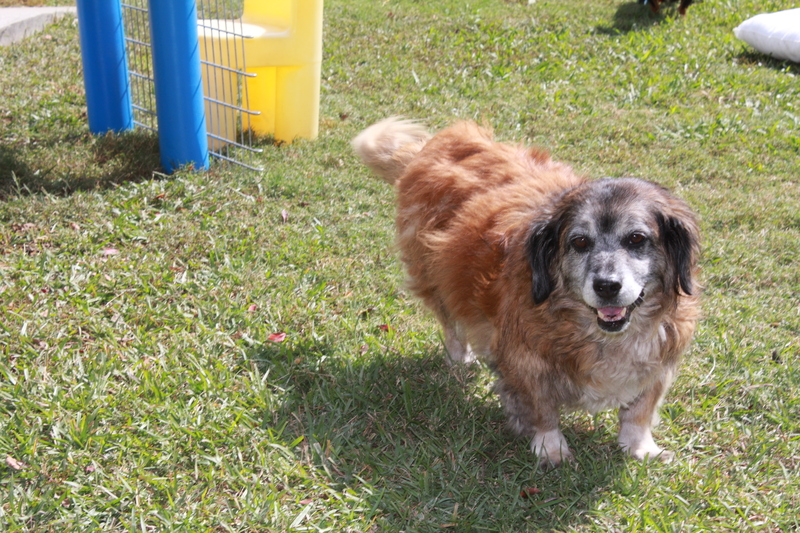 See her in the backyard, only a few hours ago, smiling as though she had been at the dog park or the puppy bakery rather than the animal hospital. Here’s Gertie from her good side. Senior year. I was editor of the school yearbook, and was consumed with it, as I am with anything I set my mind to, whether it’s a yearbook, or a young Scott who is totally-uninterested-in-Nicole, or foster dogs. I attack it/him/them with reckless abandon. As high school seniors, we were required to participate in Career Day. I was the last person to sign up to visit a local business/organization. “What are you still doing here?” one of my teachers asked. “My career is going to be in yearbooks,” I said, pulling out my cropping ruler to set up a page. “I’m observing myself working on our yearbook. Great idea, huh?” — although Mrs. Dorn, the yearbook director, was all for it, the rest of the teachers weren’t. So, I half-hardheartedly scanned the list of businesses willing to open their doors, and set off for the local veterinary clinic. I had no interest whatsoever in being a vet but thought if I had to go somewhere, at least I could see and spend time with cute animals. I walked in and met the vet. “So, you’re interested in being a veterinarian!” she said, beaming. “Uh huh,” I lied, not wanting to hurt her feelings, since she seemed excited. She walked me straight back to surgery, where she was working on a dog that had been hit by a car. I politely excused myself, went outside, and lost my breakfast. Seeing Gertie made me very nearly lose my lunch. The bright red wounds. The medicated smell. The stitches. — old fashioned and huge, the kind that don’t dissolve but must be removed in 2 weeks. Yes, I had to lie down after this photo shoot. And I had to lie down again after reading in her post-op instructions that I will be applying salve to her wounds twice a day. — starting tomorrow. I’m keeping the names George and Gertie, their Middle Mutts names, because my system of alphabetically naming fosters after SC towns/cities/counties just doesn’t work for letters like O and P. — not much to choose from. I have to admit, though, that I think Powdersville is a perfect surname for Gertie with her white, aged face. George and Gertie are my first senior dog fosters. They both have a larger rescue group than Fisk fosters committed to finding them homes. Yes, the fabulous Last Chance Animal Rescue in New York. 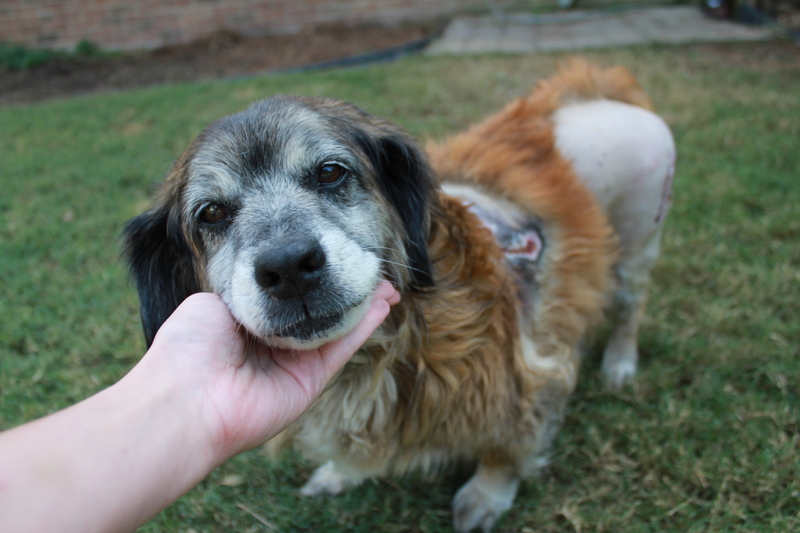 But, both George and Gertie need surgery (George on his eyes; Gertie on her leg/hip) before they’re adoptable, and surgery, along with everything else, is much less expensive in South Carolina than in New York. So, they are our house guests for awhile. My friend Kerri had asked if I could foster George for Middle Mutts at the end of August, but then she remembered that I’m fostering Chester Abbie Faith and her six for Middle Mutts and said that I had my hands full and that she’d try to find someone else. I thought she had and George slipped from my mind. To find a home for George, Kerri and Whitney had to find another person willing to foster. And they have. Trina in Newberry! So, I pulled George, hoping that Trina will be able to take him. She’s coming to see me today at 10:30 to meet my pack. Yay for Trina! I have to say, though, that George has been a pleasure. He’s a beagle, like Edisto, but at 10-11 years old, is the anti-Sto. I don’t know George’s story, though I do know Gertie’s. — or, at least, some of it. 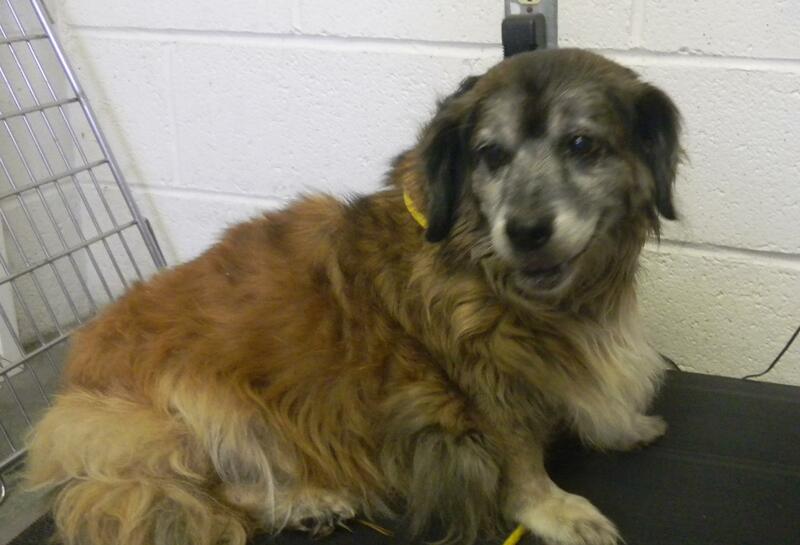 Gertie was found by family members at the home of a deceased relative. They didn’t even know that he had a dog, and they took Gertie to the shelter. Shelter workers say that Gertie has been in obvious mourning for her lost owner since she’s been there. But here’s the mysterious part. Somewhere along the way Gertie was hurt. The vet speculated that she was hit by a car, although I don’t know when that could have happened. 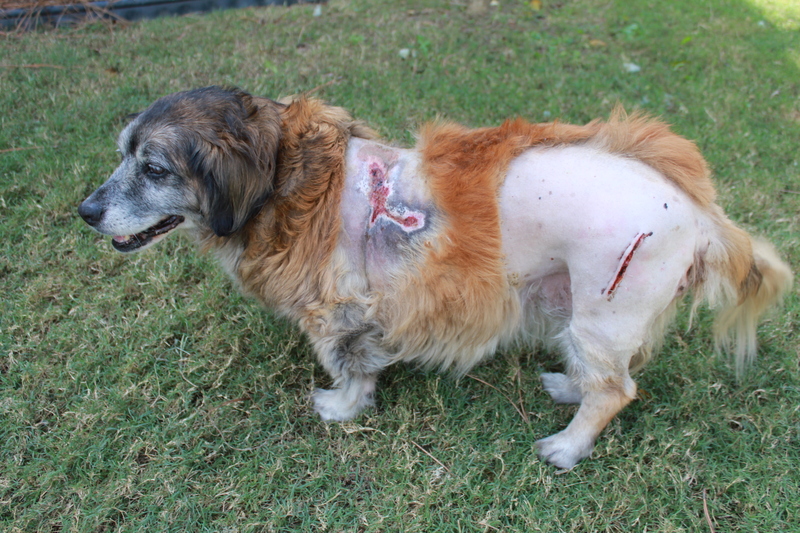 But she has a scary-looking wound on one side and a limp. We’ve fixed up a place for her in Scott’s shop, so that she can go out to use the bathroom when she needs to, without worrying about steps. The puppies are ecstatic to have a housemate. Their mother has been staying as far from them as possible, since she’s trying to wean them, so they snuggle up with MeMe Gertie, which I think is good for all involved. Photos of that to follow. In true grandmother-fashion, she’s more tolerant of the pups than their mother is, but she gets tired more quickly. At one point, she was ready to curl up ALONE on her blanket, but Fairfax was in her spot. She looked at Fairfax and looked at me. Looked at Fairfax and looked at me. I moved Fairfax. And, I could have sworn I heard Gertie sigh contently. George and Gertie have been life-savers, because they’ve kept me from fretting over Edisto and Kincaid (see previous post). Edisto is still here, and I’m thinking of taking Mom’s advice and telling the local rescue that they can come get him if they want him. I shudder at the thought of taking him myself. I don’t want him to think that I’m the one taking him to a kennel by choice. — even if he is a Goober. Then, I look at him in a wounded way, and he stops. One thing that he pointed out does make me feel better, though. Kincaid is micro-chipped with all my information (phone number, address, etc.). So, if he’s in TROUBLE, I’ll know. I’ve watched my friends at the City of Columbia Animal Shelter read countless microchips, and I know that vets do as well. So, Scott thinks that friendly boy Kincaid is inside a home right now (in either Hamptonwood East, where we live, or in neighboring Yorkshire or Kings Grant) and is licking his housemates to death. I hope so. And Scott was sweet enough to post some advertisements about Kincaid on local community web pages. In the meantime, Scott is convinced that he has finally fixed the fence. Attaching chicken wire to the chain link didn’t work, so he went and bought much more expensive rabbit fence ($25 per 10 feet). 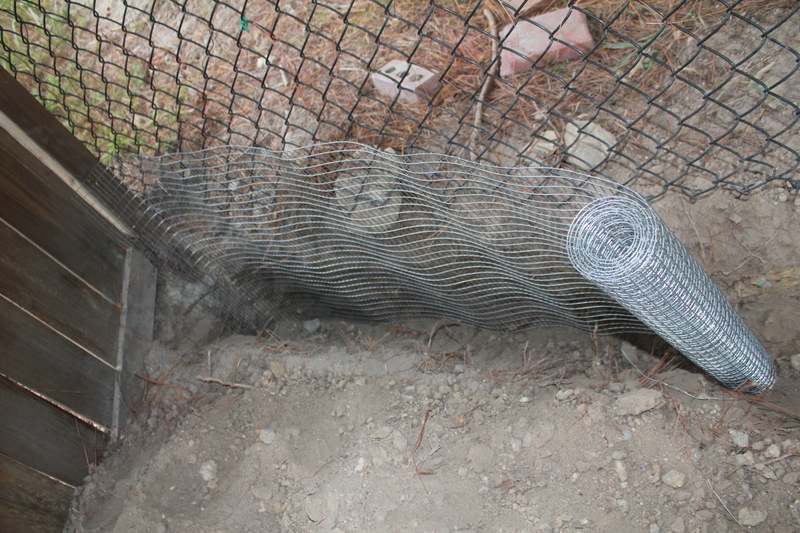 I’m sure that chicken wire keeps out chickens, and that rabbit fence keeps out rabbits, but I won’t be convinced that our fence is Edisto proof until Scott finds some Edisto labeled wire or fencing. I suggest Kryptonite as the material for Edisto fencing. At least new fosters George and Gertie are totally over breaking out of backyards. This is only one of the many wonderful things about senior dogs. To close, I’ll paste part of an article I read recently, “Older dogs make great pets too” by vets Dr. Henri Bianucci and Dr. Perry Jameson. In it, one of the docs compares his young rescue dog, Flipper, with his old rescue dog, Ariel. “Ariel sleeps a lot and does not move too quickly because of her arthritis. She was house-broken and never goes to the bathroom inside. She loves us and wants to be with us constantly, but most of the time, you do not even know she is lying beside you until she groans as she shifts positions. She still likes to swim and fetch but usually only if we prod her. She is not constantly begging for our attention. She never buries her bones in the yard like Flipper. There is something nice about an old dog. Their gray muzzles are like our gray hair. They have experienced life but are better at learning from it than we are. Old dogs are well-behaved and rarely get into trouble. They hardly ever get under foot, as that one time they were stepped on was enough to teach them for the rest of their lives. They maintain that love for us they had as a puppy but do not need our constant attention any longer. Just napping beside us seems to be enough. They listen better as long as their hearing is still good. That 15 minutes of fetch is enough for them to sleep hard all night when it used to take two hours to have the same effect. They roam less so are less likely to get bitten by a snake or hit by a car. They do not pull on their leashes but are content walking at our pace. I love both my dogs, just like I love both my kids. Ariel and Flipper are different, and I love their differences. When I am at the shelter, I see puppies being adopted but fewer older dogs. People will pay to get a puppy. (At CAS and Pet Helpers, the “cost” is more of a donation to help offset the cost of keeping them until a home can be found.) 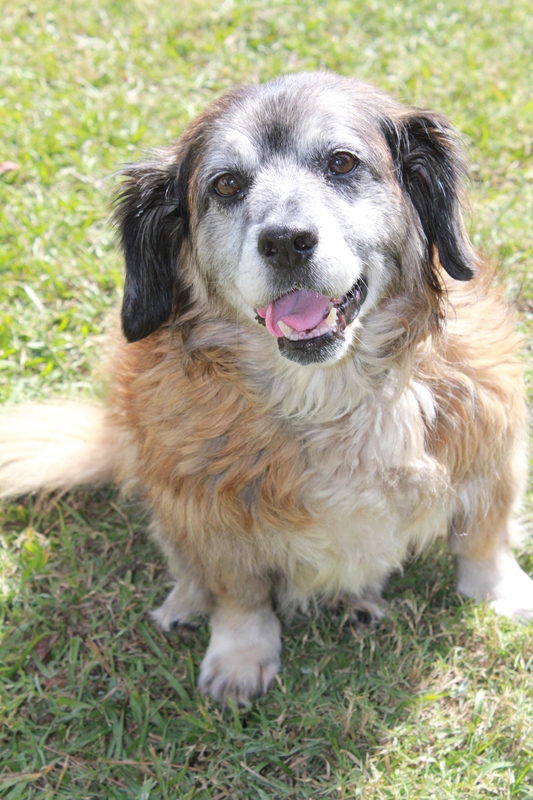 Older dogs often have to be given away (nothing is free, so they depend on donations to break even). Everybody wants a puppy, and it’s easy to see why. They are adorable and cute. Full of energy and constantly changing as they grow. 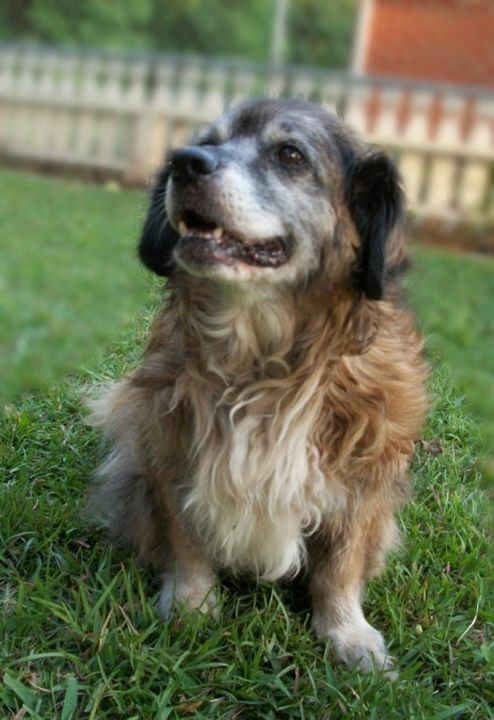 But after having Ariel, I can see that older dogs are great, too. I have learned from Ariel that life is more about being quiet and enjoying the moment rather than searching for the next thing to do. I realize Ariel will not be with me as long as Flipper, but all the pleasure her company brings me will outweigh my grief at her loss. 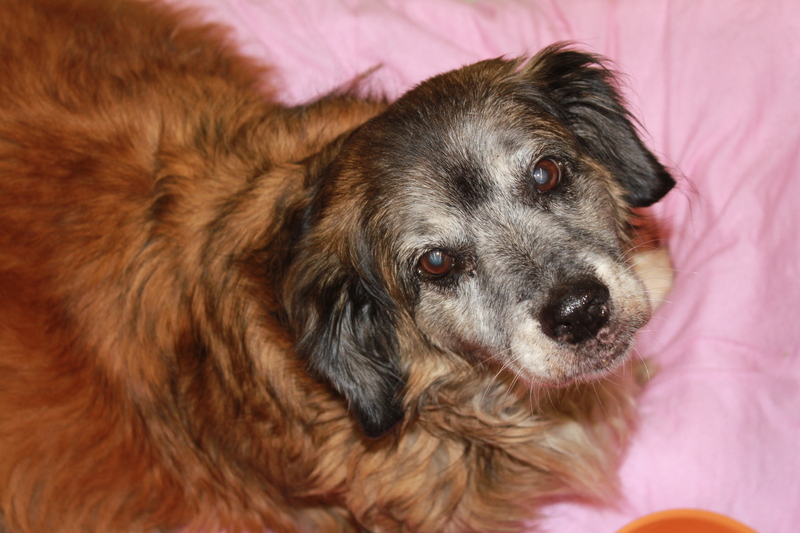 If you would be interested in adopting one of these fabulous seniors, let me know. I would love to free up their spot with Last Chance Animal Rescue for another dog!